Drum Corps International personality Steve Rondinaro has seen a lot of drum corps in his 30-plus years as veteran host of DCI's broadcast productions, but he's never started a season quite this way. 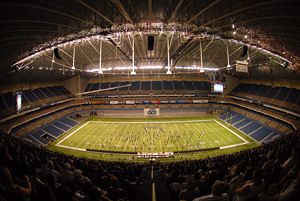 In San Antonio, Texas last Saturday night at the DCI Southwestern Championship, "Reliable Rondo" sat with staff and show designers from each competing corps and had them discuss the ideas behind their productions, explaining what they were seeing and hearing from the field as fans followed along during a live Webcast on the DCI Fan Network. "It was fascinating," said Rondinaro. "I hadn't seen any events yet this season, so to sit there with some of the people who put those programs together was a pretty cool immersion. What a great way for fans to be able to dig deeper into the corps' programs before the World Championships in Indy. I'm really anxious to watch the corps again with that base of knowledge." Rondinaro joked that after learning so much from his discussions with some of DCI's top show designers, he now "might just be able to DeLucia a thing or two," giving a nod to the encyclopedic knowledge of DCI Hall of Fame member Dennis DeLucia who serves as his fellow color commentator on other DCI broadcast projects. In San Antonio, Rondiaro got the lowdown about which parts of the corps' shows are "works in progress" and got hints of changes to come. Most helpful were insights gained from staff members about the origins and inspiration of the shows and the many things to look for (and where to look for them) so fans can better appreciate what is happening when they see these corps perform later this season. All of those performances in their entirety with the designer commentary audio tracks have been recorded and posted to the Fan Network On Demand video section. They are available exclusively to Fan Network Plus subscribers. If you weren't able to watch the Webcast with the commentary, here's a rundown of some of the things you missed, but can now enjoy at your own leisure. Visit TheFanNetwork.org today! Blue Devils – "1930" with Scott Chandler, program coordinator From viewing this video, you'll learn to listen for a number of audio nods to the year 1930 that you might otherwise miss; from popular musical tunes to old time radio commercials. Find out how the color guard transports the audience back in time through a clock formation and why the "1930" formation made on the field looks the way it does. The Cavaliers – "The Great Divide" with Jim Casella, percussion arranger You'll learn about the many subtle rhythmic effects that contribute to the tension of the show and how various echo effects return through the show. Many unique sounds are explained; such as the amplified Zen fountain and glass bottles in the pit. (There's a great quote about "chakras" that will make you smile.) And you'll always be looking for the collapsing suspension bridge and the hidden melody in the closer. Holy Name Cadets – "West Side Story '09: Conflict and Resolution" with Jeff Sacktig, visual designer We learn how the 36 brass on each side of the field in the "A Boy Like That" segment express the radically different thoughts of the two female characters, plus how challenging it is to keep these two sections playing and marching together. Especially interesting is how the color guard pulls off the segment where they have no beat to spin to. Also find out how the corps has represented its 75 years of history in the drill formations. Carolina Crown – "The Grass is Always Greener" with Michael Klesch, brass arranger and Michael Townsend, color guard designer "The Grass is Always Greener" represents the search for something that is explained in this On Demand video, but elements of diversion keep getting thrown in the way. We learn what motifs to listen to in the pieces that reflect the quirkiness of the journey. See what the color guard forms as the ideal is lost, (a tip to the Garden of Eden) and what short musical quotes to listen for later in the show that were already heard before. Santa Clara Vanguard – "Ballet for Martha" with Key Poulan, brass arranger We're informed how liberating it was for the arranger to use the original Copland "Ballet" for 13 instruments, which only later developed into "Appalachian Spring." The journey of Martha Graham and how all members of the corps were trained in her body techniques is captivating. We hear how the "big push" that is expected from the horn line isn't a push at all, (at least at first), due to the original interpretation. Bluecoats – "Imagine" with Michael Gray, visual coordinator The show is an invitation to live an imaginary life, and as such, is quite a surreal excursion, with a great amount of thought-provoking visuals. There's meaning to the design of the protagonist's umbrella and for the first time on the field, certain animals learn to fly. It's expressed how difficult it is to get others to join in a world of imagination and how the new personalities of the drum line members are unveiled. Blue Stars – "The Factory" with Frank Sullivan, brass arranger Each flag represents a piece of fabric produced in the factory, with the double sabers representing something else. You'll learn what the dancers are doing with measuring tapes, what is represented by the earlier blue and white flags and the later vibrant flags, how inspiration for this program came from a PBS documentary, and how members were exposed to stories from actual World War II veterans. Phantom Regiment – "The Red Violin" with Dan Farrell, program director It's explained why much of the show was rewritten just prior to San Antonio and how that's just a small part of what will be retooled by the end of the season. The star of the show heads somewhere during the swing tune, and we're told where that is. Four strings and half a violin appear as the storyline unfolds. It's up to you to decide the meaning of the comment, "A nice happy ending, which is very much like us." Boston Crusaders – "The Core of Temptation" with Jay Kennedy, program coordinator and Brian Murphy, visual coordinator It's stated by the commentator that this might be the best corps Boston has ever had. Find out where you can see multiple drill form appearances of an apple; and gain insight to their meaning. Temptation might win out in this storyline, but we're informed we have to wait until the DCI World Championships to find out. Glassmen – "The Journey of ONE" with Sal Salas, program coordinator What flag design is prevalent throughout the show and why are individuals pulled out to highlight the concept? How do individuals become part of the group and what is represented by the trumpet call? The individuals who respond to the clarion call must make decisions? What will they do? These and many more questions are answered in this designer commentary. Blue Knights – "Shiver" with Marc Sylvester, visual designer Listening to Marc Sylvester is always a blast, and this On Demand video is worth it for that alone. He's very honest in pointing out what wasn't working for the corps that night in San Antonio and he catches himself expressing something that might have been bleeped from television in the 1950s. Especially intriguing is the little visuals that respond to musical hints about snowflakes and where to look to see an avalanche. Troopers – "Western Side Story" with Dean Westman, program coordinator and Ralph Hardimon, music director Parallels to the original "West Side Story" storyline are expressed in the drill. It's particularly enjoyable to hear the multiple "favorite" moments. Without watching this video, you're likely to miss just how all the various melodies are creatively laid over one another. But don't get too attached to the ending. We learn how something brand new is coming. Colts – "Fathoms" with Jude Boughton, program coordinator In the beginning fo this program, the flag in back represents a lighthouse, shining light on the water. This and many other nautical themes are explored. How are the seagull sounds produced? What does "Ebbtide" represent after the excitement of the tumultuous ride across the waves? What is developing with the hurricane motion and what is that big flag over the water? All are answered in the commentary. Madison Scouts – "Rel?ˇmpago" with Ken Karlin, visual designer Many may not know that the character Rel?ˇmpago actually existed as a south-of-the-border comic book superhero. We learn what the name means, explaining the many lighting bolts near the beginning. The character fights for justice through the interplay of the horns and the guard. But can you believe the bad guy wins? Crossmen – "ForbiddeN" with Mark Chambers, director Much of the commentary is about how the drill formations and music reflect two lead characters who can't be together. Being a hint of something larger, the eye might not instantly see an obvious corps trademark for what it is. Fully explained is the great degree of thought given to this storyline. The Academy – "The Ascent" with Richard Hinshaw, drill designer and Brandy DuBose, color guard caption head We learn that the use of the ropes is the start of a journey to climb a mountain, but that it really represents so much more. The double peaks of the mountains could also stand for something more literal. Flags capture the look of an Arizona sunset and you won't miss the arrow pointing up toward a snowcapped mountain peak at the end. Sprit – "Live…In Concert!" with Mark Waymire, director of programming and education The commentator points out the directions the "stage manager" is giving to the various performers, like instructions to out-of-uniform members to get dressed for the show. The doors open and yellow flags "turn on" the spotlights. We learn the multiple personalities of the various performers, and that flag designs are based on something many have had hanging on their walls. Pacific Crest – "El Corazon de la Gente" with Jeff Sterrett, program coordinator We are presented with many references to the day in the life of a Latin American village. There are groups of street musicians to look for and jubilant fireworks in the sky, one bursting forth from a pi?±ata. The color guard represents something that is a treat for all gathered around. At the end, there's a visualization of one of Latin America's favorite spectator sports. Mandarins – "Absolute" with Greg Mar, program coordinator A few of the works are already known by drum corps fans, but put together in this collection of "Absolute" favorites, the works take on a new dimension. We hear why each work was chosen and how it represents the absolute pinnacle in its genre. Pioneer – "Celtic Trinity" with Donny Allen, brass arranger "Celtic Trinity" is represented by music and visuals that explore not only the "Celtic" in the title, but also the "Trinity' element. We're informed of the importance of the Trinity in Celtic folklore and how this is developed through assorted drill forms; including shamrocks and horns in threes. You'll also want to hear about the three blond "Trinity Sisters." Cascades – "Beyond the Forest" with Ron Comfort, program coordinator We hear what it took to get the corps back on the field and how the members were encouraged to come on board. The very opening drill form in this program represents a literal object from the Northwest and the color choices in the color guard further deliver the sense of the environment. As for the color guard, it's explained why it's a challenge to find guard members in the Northwest.